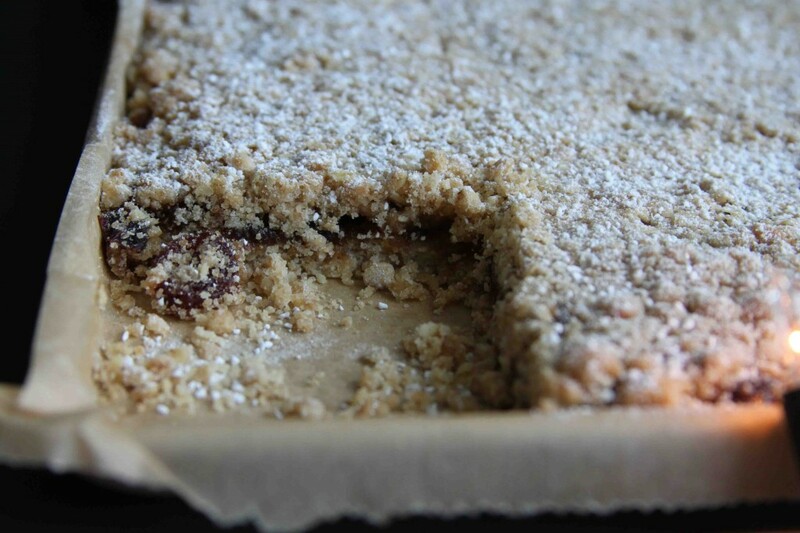 I often make something we imaginatively call Jammy Oaty Slice – can you guess what is in it? Of course you can and I highly recommend it as a delicious tea time offering. 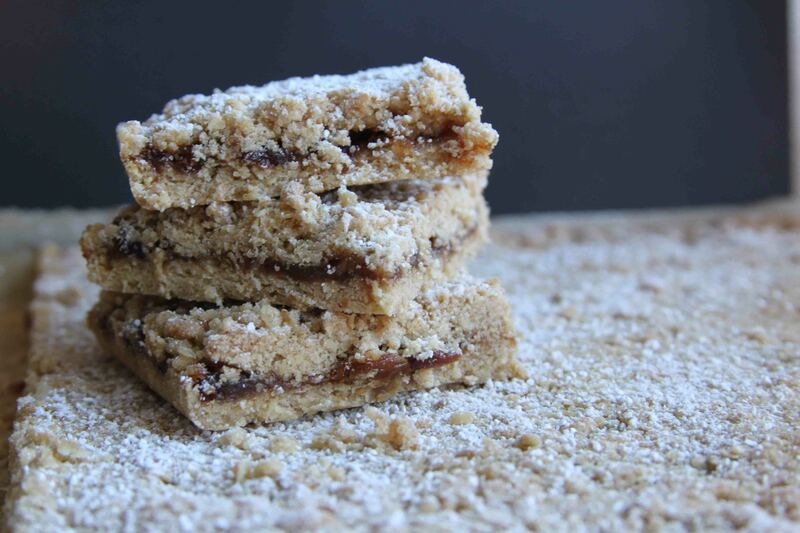 The other day I was looking at a tray of it cooling ready for scoffing and it reminded me of the mincemeat slice that used to adorn the bakers’ shelf at Christmas in Yorkshire. Heavily dredged with icing sugar, it was completely white from the top and the layers were crisp and even (really!) in the way only a practised hand can accomplish. So of course I had to have a go at making it myself. Whilst I love mince pies, my immediate family (i.e. the ones I actually live with) don’t like anything with cooked raisins or dried fruit. This means that if I make mince pies then I am the only one who will eat them unless we have friends over and when it comes to a Christmas cake…. Well, suffice it to say I ate all of the the last one which graced a tin in our house. All of it and I made another in January because I had enjoyed it so much….. These little squares are much safer then. Rather than a huge cake winking at me from the corner I can safely eat one of these treasures with a cup of tea on a daily basis without having to book into the gym afterwards. Like two layers of shortbread with mincemeat in between, somehow better than a traditional mince pie if that is not too shocking a statement? The oats add an extra element which is just right and of course go a good way towards balancing out the sugar and butter. Heading for health food is what I say…. 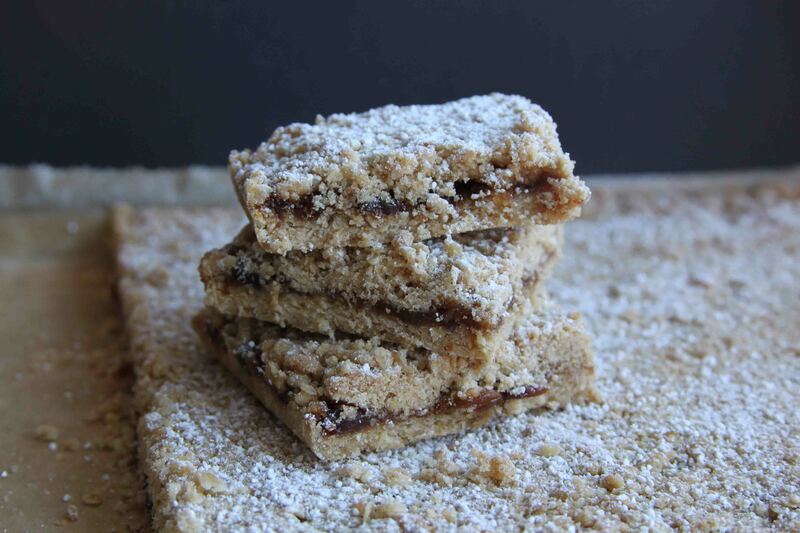 If you want to go for the original Jammy Oaty Slice then just replace the mincemeant with jam, I favour raspberry. However, please do give them a go this Christmas, they are a million times easier than mince pies if you need to make a batch for a sale and are just delicious. Preheat the oven to 180. Line a tin of approximately 23cmx32cm with baking parchment. Whizz together the flour, oats, butter, sugar, baking powder and salt briefly in a food processor (you want it combined but not forming a ball of dough as it needs to be quite crumbly for the top layer). Tip half of the mixture into the baking tin and press it to cover the base in an even layer. Spread the mincemeat over this and then sprinkle the remainder of the mix evenly over the mincemeat and press it down gently. Bake for 30-40 minutes until golden on top. Remove from the oven and leave to cool completely before dusting with icing sugar and cutting into squares. This entry was posted in Biscuits, Cakes, Food, Puddings and tagged Christmas, mince pies, mincemeat, shortbread, treat by Anna. Bookmark the permalink. Is it sad to say that I have never ever made squares in my entire life? I would love to try these. I’ve just made these as pressies for teachers but I’m not sure they’ll be getting very many. Thank you Anna, delicious! Oh, and by the way I missed out the baking powder by mistake, but they still work.